This time of year is full of zest, vim and vigour for Lutherans. We just celebrated Reformation, singing with gusto its battle hymn, “A Mighty Fortress Is Our God,” and today we sing to the great march of Ralph Vaughan Williams “For All the Saints.” Isn’t it a little weird that we sing these hymns as if goose-stepping in jack boots? I suppose we feel it is our time to march a little proudly, a little boldly, a little less Canadian. Let’s look at today’s psalm. It gives us our marching orders for All Saints’ Day. The second half (v. 6-9) is the Christian soldier’s delight. “Let the high praises of God be in their throats and two-edged swords in their hands, to execute vengeance on the nations and punishments on the peoples, to bind their kings with chains and their nobles with fetters of iron, to execute on them the judgment written! This is honour for all His godly ones. Praise the LORD!.” This is the honour of the saints, to execute judgment and vengeance. There is some kind of a disconnect that gives us trouble here. We are confused and it shows in the way that we proudly proclaim “A Mighty Fortress” to be a battle hymn, while it speaks of losing, life, goods, fame, child, and wife. Should we be singing that standing upright on our our feet or down upon our knees? And we march to “For All the Saints” and sing, “Oh, may Thy soldiers, faithful, true, and bold, Fight as the saints who nobly fought of old And win with them the victor’s crown of gold!” Is it our fierce fighting that wins the victory? A later stanza speaks of us feebly struggling, in this fierce and long warfare. How did they do it, those who “nobly fought of old”? It was not by taking up a war-cry and running into jihad. Our Lord does not describe them that way in today’s Gospel (Matthew 5:1-12). They are described as the words of our hymns describe them, not as the manner of our singing would describe them. They were: poor in spirit, those who mourn, the meek, those who hunger and thirst for righteousness, the merciful, the pure in heart, the peacemakers, those who are persecuted, you who are reviled. What kind of soldiers were they really? On Sunday morning at Resurrection the Sunday school children sang stanza two of “A Mighty Fortress”: “With might of ours can naught be done, soon were our loss effected.” Those gentle, feeble voices proclaimed the truth of the text much better than having the men sing that stanza in their deep, pounding baritones, trying to outdo one another. Similarly, down in the Sunday school area there are some children’s projects that have been left hanging there for years. By the printing of the children’s names on them they look like they were done by first or second graders. They have been hanging there so long that those children are now in high school. They are cutouts of little boys and girls with pieces of armour stuck on them, the armour of God from Ephesians, chapter 6. And they all look like a toddler version of David wearing King Saul’s armour, in preparation to fight Goliath. But that is what we are. St. John wrote in the Epistle for this day (1 John 3:1-3) “Beloved, we are God’s children now, and what we will be has not yet appeared.” That is the disconnect with which we struggle. We don’t want to be God’s children now. We want to be what has not yet appeared. We want to seize the kingdom of heaven. We want to inherit the earth. We want our satisfaction. We want to execute judgment and vengeance upon the nations and we want to be the ones to bind the kings in chains. We don’t want to admit that we want to be like Bible-thumping baptists only calling ourselves doctrine wielding confessionalists. But the victory cannot be won by our fight. We do not win the crown of gold by our faithful, true, and bold fighting. The crown has been won for us by Jesus Christ. And even He did not do it with fierce fighting. He did it in humility. With meekness, purity, and mercy He won the everlasting day for us. He has shown us a very unorthodox way of fighting, that is completely against our nature. For how can we fight for victory with our hands folded. It doesn’t make much sense. How can we be fierce in battle while staying on our knees? How can we win an argument by confessing our sins, or convert the unbeliever with a word of forgiveness? That is how our Lord Jesus Christ won the victory over your sinful nature. With the sweet and gentle promise of the Gospel, He converted your hard and stony heart. Only having heard of His great sacrifice for you can you confess your sins of not being content as God’s child and wanting to be the warrior who wins his own salvation and a substantial victory for the church so that you can get your name onto the Christian calendar. There is a great disconnect between your sin and how Christ won salvation for you. He humbly submitted Himself to death, even death upon a cross (Philippians 2:8). In that submission is your salvation. You are forgiven because Jesus laid down His almighty life for you. As you read the Gospels, what appears to be awkward in Jesus’ life was not His passion and crucifixion, they seem to fit right in with the rest of His life. The account of His triumphal entry into Jerusalem is what seems out of place and a bit disconnected with the rest of the work of Christ. And that is why it should be a little bit awkward and out of place for us to sing a battle hymn of the Reformation or to sing “For All the Saints” to a marching tune. The texts are awkward with their accompanying music, because they proclaim what has not yet appeared, just as did Jesus’ triumphal entry into Jerusalem. They proclaim a victory for the saints that we cannot yet see. They declare a crown of glory while the fight is still fierce against us and the warfare gone on far too long. So also in Psalm 149 the LORD is praised for adorning the humble with salvation (v. 4) and the saints on their beds, even their death-beds, sing for joy and execute judgment and vengeance in their own humiliating weakness. They praise the LORD by dancing in the throes of death. Their tambourines are made from their own flayed skin, and music upon their lyres is the plucking of gut stretched across a wooden frame (St. Augustine, Nicene and Post Nicene Fathers, first series, Vol. VIII, page 678). 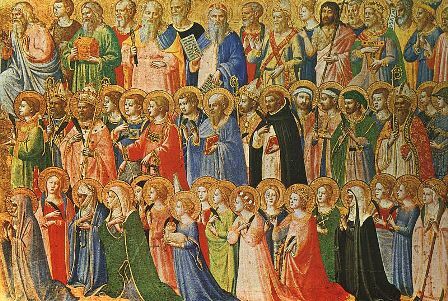 These are your saints faithful, true and bold. The peace of God which surpasses all understanding keep your hearts and minds in Christ Jesus.